William Garden was, and continues to be, an inspiration as well as instructor and advisor. In my work his writings and drawings are still (in our modern design age!) some of my most often used references. The maxims he gave me in our rare phone conversations are passed on to every aspiring designer who contacts me. For me both as a person and a designer one of his most important lessons was humility in the face of adulation. His willingness to stand back and let the drawings and boats stand or fall on their own merits was a revelation to me when I first encountered it. In an age (40 years ago) when designers such as Phil Rhodes and Olin Stephens wore a clean white shirt and tie every day without fail, Bill Garden was casual and approachable in paint spattered overalls. The impression he gave was that William Garden did not take himself or this business of design too seriously. One always finds clues to this in the drawings; old carrot nose asleep in a corner, the casual rounded lettering, freehand shading, occasional full size details of a casting or tricky bit, the rum keg, and wildly varying line weights. 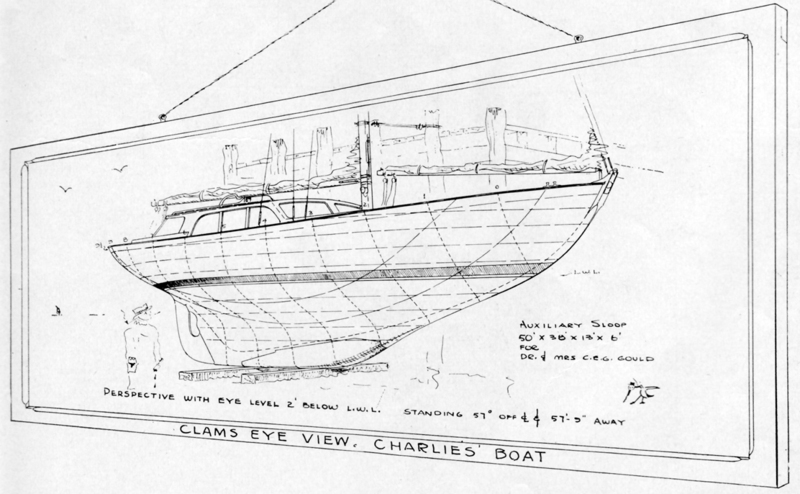 That instantly recognizable drawing style captivated the observer and indicated a creator head over heels in love with the whole idea of this particular boat. The enthusiasm and concern over details carried a Garden design beyond mere “construction drawings”; they are keys to a romantic vision that has the intrepid skipper cleared away for the South Seas before the first board is cut. Almost incidentally the drawings are also great art. This is another important lesson from Mr. Garden. Every boat is part of a romantic vision, whether it’s winning a race, catching a big fish, or sailing to the South Seas. 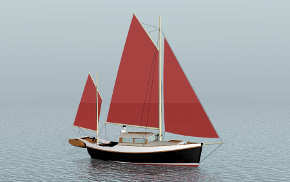 If the designer can transmit his understanding of the vision, the boat is sold. I find myself repeating his advice often. “Every boat can be improved with hindsight” came up the other day. “Publish or perish” was something he told me almost 30 years ago and remains true today. “Yacht design is the road to starvation”, and “To be a yacht designer you gotta be tough, and have an ego”; he was dead right on those. Sometimes when a client’s conflicting requirements have boxed me into creating a particularly unsatisfying mess, I’ll step back and think, “What would Bill Garden do?” Usually this leads to a clean sheet of paper and a more unified concept of stronger character. Another William Garden lesson involves regional design character. His example proved that strong regional design (in his case Pacific Northwest) could compete on the world market. 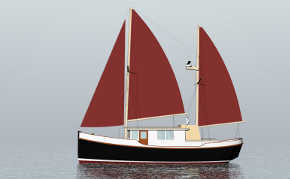 His immensely successful character ketches such as the 34’6” Foam and the 41’ Sea Wolf for Bill Hardin were rooted in West Coast lumber and sealing schooners. More significantly, his raised pilothouse (with wrap-around dodger) style motoryachts starting with Blue Heron I became recognized worldwide as PNW designs and continue to be a popular style in current production. In today’s design market it is somewhat rare that regional style is allowed at all, giving rise to generic design style that becomes characterless and ultimately boring. 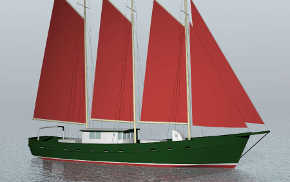 Witness Italian production of something called Downeast Lobster Boats that resemble nothing this side of a running shoe. When looking at any new design or designer’s work I often consider originality. Is it derivative or is it original work? There are, to my mind, still very few designer’s doing truly original work. Some might say this is the market’s fault, as I mentioned above we’ve developed a generic style, but I still believe the “real” role of the designer is to show what’s possible. 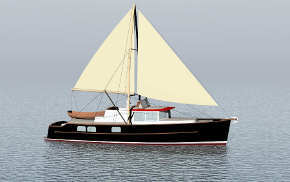 I think William Garden did that a lot; the 42’ tri-cabin Wanderer motoryacht which spawned 1000’s of Taiwanese imitations, the 36’ Willard Vega, forerunner to the entire heavy-displacement trawler yacht segment, and the pilothouse motorsailers (Decision, Discovery, Gulf 32) on which most current production cruising designs seem to be based. These are examples of commercial possibilities, but more exciting for the designer are the long and lean radical concepts like Oceanus, Claymore, Tlingit, and Captain Teach. Designs which pushed both stylistic and technical boundaries in their day. He will be missed but his work is well cared for and remains available. It’s up to us to carry his efforts forward.